A recent blog article on The News & Observer website reported significant power bill savings among Raleigh, N.C.-area Progress Energy customers who switched to solar hot water systems. can slash water heating utility bills by as much as 80 percent. In Progress Energy's report to the N.C. Utilities Commission, customers in their year-long pilot program saved an average of $235 a year by switching to solar water heaters. The savings represented a 63 percent average annual savings on the water heater portion of each customer's power bills. As part of the pilot, Progress contributed $1,000 to the purchase cost of each customer's solar water heating system. Progress reported that the solar systems cost anywhere from $4,000 to $12,375 per home. Naysayers were quick to jump on the cost of the systems as a major deterrent, recommending traditional water heaters or do-it-yourself solar thermal collectors. But well-designed and professionally-installed solar hot water systems come with distinct advantages over both DIY and traditional water heaters. To begin with, a homeowner rarely pays the full price of a solar hot water system. In North Carolina, for example, solar water heaters qualify for a 30 percent federal tax incentive and a state tax credit of up to $1,400. Other states offer similar rebates and incentives, as do many utility companies, cutting the cost of a new solar system by about half. Homeowners will also enjoy more savings over time using a solar water heating system, despite the initial investment. According to the U.S. Department of Energy (DOE), water heating bills should drop between 50 to 80 percent after installing a solar system. Because solar energy is free, homeowners also have long term protection from future fuel shortages and utility price hikes. If you're building a new home or refinancing, the DOE says the economics are even more attractive. Including the price of a solar water heater in a new 30-year mortgage usually amounts to between $13 and $20 per month. The federal income tax deduction for mortgage interest attributable to the solar system reduces that by about $3–$5 per month. So if your fuel savings are more than $15 per month, the solar investment is profitable immediately. On a monthly basis, you're saving more than you're paying. So why not enjoy those savings with a DIY solar water heater? Although the technology behind solar water heating is simple and numerous plans for do-it-yourself solar systems are available on the internet, a DIY solar hot water system can be an expensive mistake. Firstly, to qualify for most state, federal and utility rebate programs you'll need to show that your collector and/or system is rated or compliant with various governing agencies. Some of these organizations include the Solar Ratings & Certification Organization, the Florida Solar Energy Center and the Industry Association of Plumbing & Mechanical Officials. These independent organizations develop codes and criteria specifically for solar thermal systems to protect consumers and to hold manufacturers accountable for the safety and quality of their products. A high quality solar thermal collector will also come with a comprehensive warranty, protecting the purchaser for an extended period of time. Aurora solar hot water collectors by Solene, for example, come with a 10 year warranty plus a bonus lifetime limited warranty. It is important to note, however, the warranty requires that the collector is installed by a trained, authorized installer. In addition to warranty coverage, homeowners should seek a trained professional for a solar hot water system installation for performance, safety and protection from liability. Proper installation depends on a variety of factors including climate and local building codes. A qualified solar thermal contractor can ensure you're getting the best performance and return on your investment while adhering to code requirements. Working on the roof (where most solar thermal collectors are mounted) can be dangerous, especially when working with large panels, electric wires (in the case of active systems) and water. You should consider the long term protection of your home, as well. An untrained individual can make mistakes leading to a myriad of future problems in your roof and attic, not the least of which could be flooding and fire. performance from a solar water heating system. A solar hot water system can be an excellent investment with long-term benefits for your budget and the environment. By choosing your system and your installation professional carefully, you can reap the rewards of clean, renewable solar energy for years to come. 1. What is solar thermal? 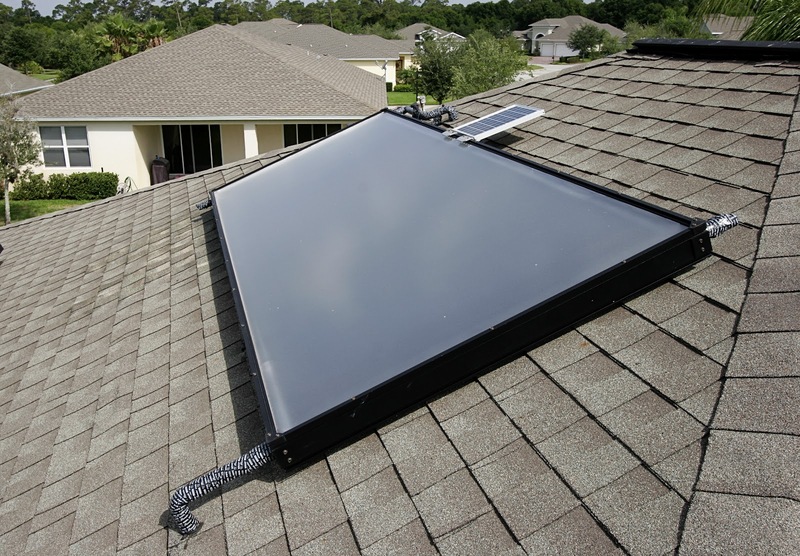 Also called Solar Water Heating (SWH) displaces the use of the existing hot water heating system, typically supplementing your natural gas, electric or (in remote locations) propane systems. 2. Generations of Solar Water Heating. SWH is a mature technology dating back to Leonardo da Vinci. In 1909 an American inventor patented the grandfather of our current solar water heating technology- with a separate storage tank. Unfortunately, the discovery of “abundant” and “cheap” fuel sources busted the solar water heating boom. In the new millennium and with our realizations about limited fuel sources- solar water heating is back on the boom cycle with certified technologies, qualified installers, like Aztec Solar, as well as state and federal rebates. 3. What? 1/3 the price! Yes. SWH heating systems are a third of the price of solar electric and $1 for $1 produce more energy. 4. Rebates. The savings with SWH technology is better than ever, with maximum utility rebates of $1850 and an additional 30% Federal Tax Credit. Get back some value as a utility ratepayer for clean, green technology. 5. Shading – no problem. Another amazing attribute of SWH is that the panels generate heat, not electric current (AC), therefore solar water heating collectors are not as sensitive to shade or cloudy days. 6. Plenty of water. A home’s average water heating tank is 50 gallons, whereas the average solar back up storage tank supplies 80 gallons of sun heated hot water. This means plenty of hot water for the showers and the laundry. 8. It only takes two. Two solar water heating collectors can supply a family of 4 with between 60%-75% of their water heating needs annually. If you don’t think you have the roof space for a 3kW solar electric system, you should consider hedging against your future utility bills with a SWH system. Solar thermal facts compiled by Aztec Solar in Rancho Cordova, CA. See the original document here. For more solar hot water system information, visit the Solene website. Solene solar hot water systems offer the industry's best-performing and most reliable solar solutions for commercial and residential hot water needs. Don't miss out on solar tax credits for solar hot water and solar electric! Did you recently purchase solar for your home? You may have federal tax credits available to you! If you haven't yet made your purchase, you can still qualify for a 30 percent credit if you act before the end of 2016. The residential energy credit for installing solar water heating and electric equipment is worth 30 percent of the cost of the system placed in service through Dec. 31, 2016. There is no limit on the cost, or on your income, to qualify for this credit, taken in Part II of IRS Form 5695. 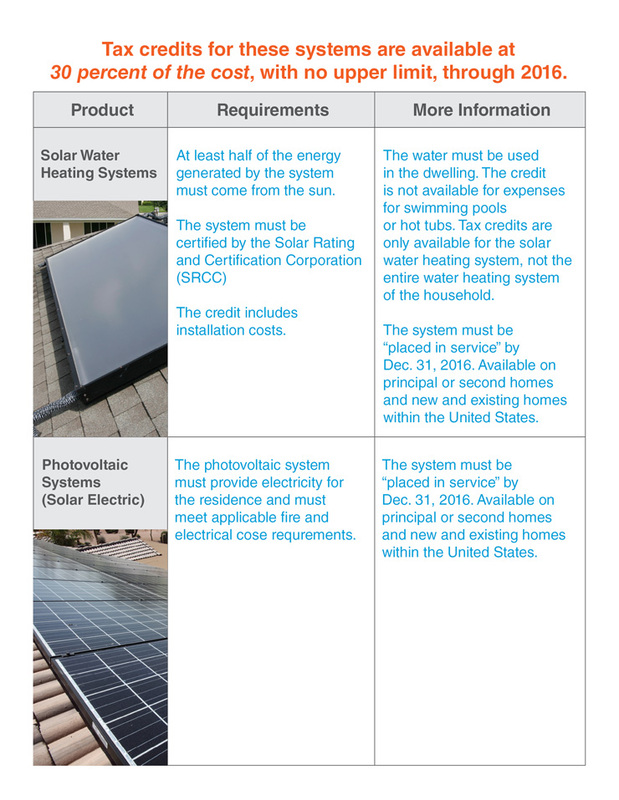 According to the U.S. Department of Energy, to qualify for the 30 percent credit on either a solar water heating or a photovoltaic (solar electric) installation, the system must be placed in service by Dec. 31, 2016, must be available on your principal or second home (within the United States) and can be installed on either new or existing homes. To qualify for credit on a solar water heating installation, at least half of the energy generated by the system must come from the sun and the system must be certified by the Solar Rating and Certification Corporation (SRCC). The water must be used in the dwelling and the credit is not available for expenses for swimming pools or hot tubs. The tax credit is only available for the solar water heating system, not the entire water heating system of the household. To qualify for a credit on a photovoltaic (solar electric) installation, the system must provide electricity for the residence and must meet applicable fire and electric code requirements. Generally, you can include labor costs when figuring the credit and you can carry forward any unused portion of this credit. These are federal credits and they can be combined with other state, local and utility incentives. To determine if you are eligible for other incentives, visit the Database of State Incentives for Renewables and Efficiency. As you prepare to file for your tax credit, save or make copies of your receipts and be sure you have the Manufacturer Certification Statement for your records. UMA Solar offers solar hot water and solar electric systems that are eligible for these federal tax credits through its nationwide network of dealers. 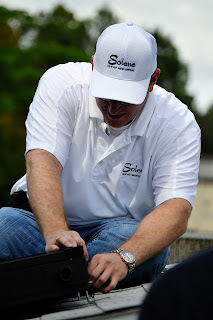 For more information about our solar hot water systems visit www.solene.com and for details on our solar electric systems, visit www.heliolectric.com.